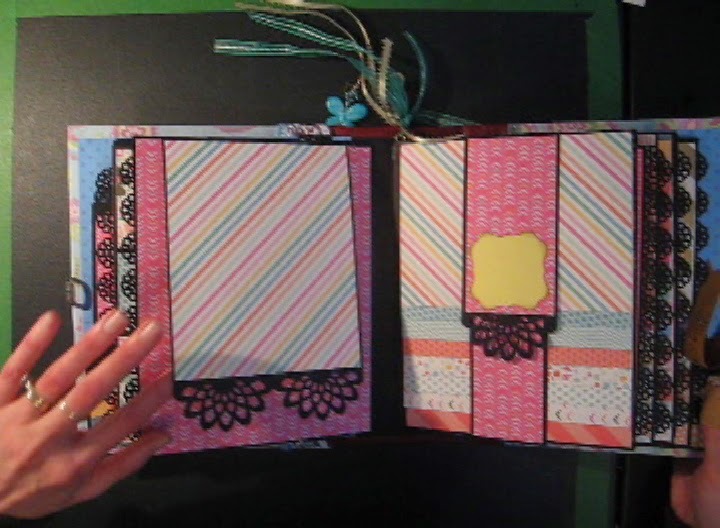 In my tutorial, I show you how to create my waterfall mini album shown in the photo on the left. This album is ALL ABOUT THE PHOTOS - there's room for 117 PLUS good-sized pictures so not much cropping required! Because this album holds so many pictures, it's perfect for a themed album such as vacation photos and special events when you take lots of pictures that you want to keep in one album. The waterfalls alone hold 90 photos on the 6"x 4-1/2" pages, and there's more space on the large pocket tags and flaps. The tutorial contains measurements for every piece you will need to cut. I show you how I make and wrap the covers with paper and fabric, how to bind the pages into the album and how to make the closure with a Tim Holtz buckle. Use the supplies you already have on hand if you prefer. This album is a great way to use up those leftover pieces of paper from your other projects! The tutorial is in PDF format and contains 46 pages of extremely detailed step-by-step instructions from start to finish with 193 photos I took as I was creating the album. I show how to create each of the pages, how make the covers and spine, how to bind the pages into the album, how to make the buckle closure and how I embellished the album. Measurements are included for each piece you will need to construct the album. The finished album is beautiful and not difficult to construct. With assistance from the videos, you should be able to complete a beautiful project even if you're not very experienced at making mini albums. I constructed the album pictured as I was writing the tutorial. It is made with the "Boardwalk Sherbet" paper pad by Craft Smith and a few more sheets of scrapbook paper from my stash. By purchasing this tutorial, you can make as many of my Waterfall albums as you wish for personal use. You can also make and sell the albums you make. If selling albums online, please credit me by including a link to my website: “Tutorial for making this album is available from www.scrappinrabbit.com”.